I always thought that kid died. You may be right, as I am not sure. Thank's to you guys for turning me on to those You Tube clips about the Haunted Castle I never knew they were out there and they brought back alot of memories for me, some that I had forgot about. The comment that the singer from Golden Earring made that was mentioned on those clips was "It Looks Like Someone Is Having A really Big Barbecue Here At Six Flags Tonight" And he didn't stop the show to say it, he said it in between songs. And from what I remember, that door never had a chain on it. It was always open, cause' I was one of the kids that used to sneak out there all the time. And in the clip's he said the strobe was on the night of the fire, and it was not. I remember that clearly because it was pretty boring in that section with out it on, and it was not on that night, I am positive about that. That garden was never a memorial for the Haunted Castle. There never has been one, and there never should be one. The park is an escape from reality, and should not be a reminder of tragedy. The park had promised to never build a ride on that spot ever again. Then they moved the bumper cars over it 10 years later which was not right of them to do after promising that they would never put a ride over that spot again. I am just saying that when Old Country reopens they should reinstall a garden on that spot, just a plain, nice garden nothing else about the Haunted Castle fire like signs or plaques, most of the GP would not even know what the garden would be for so it would not hurt their escape from reality. They never made any such promise. Building a memorial there would be just as pointless as all the roadside memorials that pop up at accident sites. Wow man, you are dark and yes the park did make that promise. The only pointless thing is arguing about this in a spotlight request topic which is why I am going to stop right here since I don't want to see this degrade into a flame war. You might want to think twice about what you just posted since it is pretty heartless. Wow man, you are dark and yes the park did make that promise. No, they did not make any such promise. The company's owners at the time may not have touched that land for a while as an unstated homage, but no promises were made of that nature. The only pointless thing is arguing about this in a spotlight request topic which is why I am going to stop right here. I think you might want to think twice about what you just posted since it is pretty heartless. I have to agree with GACoaster. A headstone is a monument appropriate for a death. If an accident occurred directly in front of my house, I would neither wish to be recognized for nor reminded of that tragedy by what has become acceptable littering. All of the items laid roadside could be laid at the grave(s) of the victim(s). And now, BACK TO SPOTLIGHT REQUESTS. Roadside memorials are pretty stupid, if you ask me. And I feel that way cause' usually they are there because of a D.U.I. I see the one on 206 by Atsion Lake where those kids were coming home from Casbah at 4:00 A.M. If they followed the rules, it would not be there. I would enjoy a spotlight on Rolling Thunder. It was the newest ride the first time I went to Great Adventure, and is still a lot of fun, even though it no longer dominates the skyline. Wanna feel old...... Rolling Thunder will be 30 years old next season! Maybe we will see it run backwards once again! Rolling Thunder would be a good one and after riding it so many times this season already and falling in love with it again I would love to get a spotlight on it. They usually don't, but that will hopefully not be the case next season! The '9 years are always the best. '79 gave us RT, '89 yielded GASM and '99 saw the WoL. I hope next year is something like that for the everybody's sake...more so '99 than '89! I was thinking the same thing. Probably next year's ride will be themed to the new Terminator movie. We won't see A coaster till 2010,we will get a large flat or we will see a couple smaller flats. Speculate about the future HERE. This thread is for spotlight requests. I think it's time for one of the park's "Big Guns" so to speak, to be in the Spotlight, Medusa. It was the first of it's kind and still is one of the best rides anywhere. This might sound a little crazy, especially because all of the spotlights have been on park attractions, but I would like to see a spotlight on Larry B. Cochran. Personally, I think he influenced the park more than anyone other than Warner LeRoy and certainly laid the ground work for the park becoming the "cash cow" and (ultimate) flagship of Six Flags. I believe I have previously seen the clips you are speaking of and had considered positng links to them on here. After talking with GACoaster about it and watching them again, they don't seem like they would fit only because there really is a spin to the documentary that would be unfair to present unless there was a counterpart to it giving the other side of the events. If I recall there is really nothing presented from the stand point of the park or their employees, and the spin of the documentary does seem to shed a bad light over the park for reasons that didn't have to appear. I did enjoy watching them when I first saw them, but since then have examined them again and came to see where things coud have been presented more fairly without bias. Keeping on with the topic at hand however I think with it being summertime which is always a very festive occasion I would like to eventually see the Northern Star Arena in a spotlight. 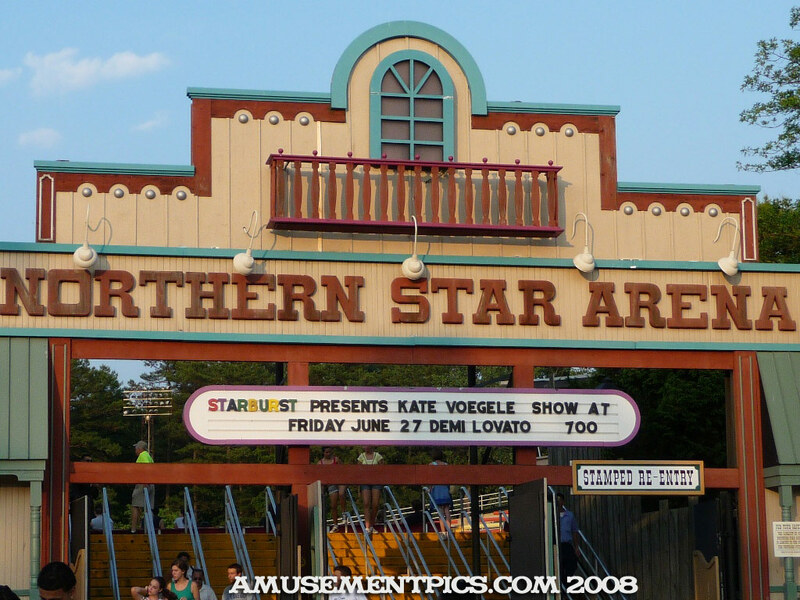 It has had so many nice shows andconcerts over the years as well as other things in the park it would be great to see them summarized within a spotlight of the Arena. I'd also like to see a spotlight on the arena. Until then, can anyone tell me exactly when and why the name changed from The Great Arena to the Northern Star Arena?... 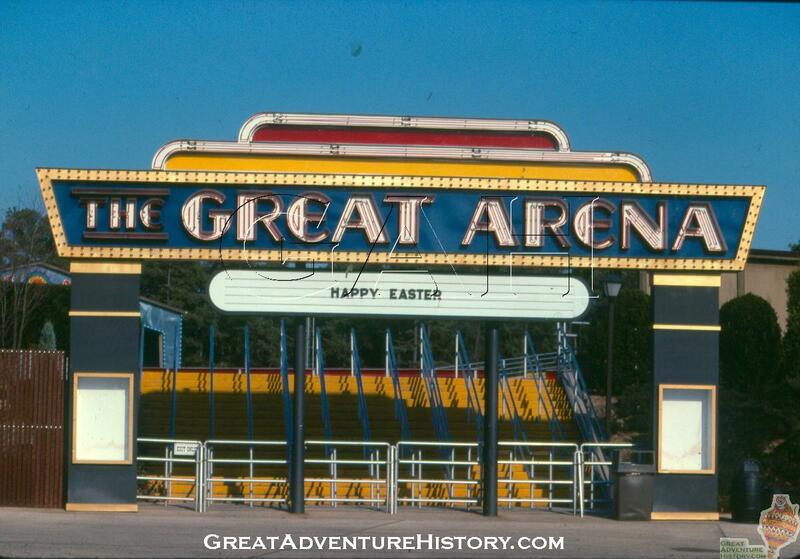 I'm sorry, but personally, The Great Arena just is so much more appropriate and original. Northern Star Arena sounds like something Ray Williams might have brought with him from his days at SFOT (which has the Southern Star Amphitheater). Good suggestion! We have a lot of great material to use for a Great Arena Spotlight including sound movies of the original Wild West and chariot/jousting shows. We just need to work it into the schedule. The Great Arena became the Northern Star Arena in the sping of 1993. It was part of the park-wide rethemeing of much of the park and coincided with the Best of the West section being renamed Frontier Adventures. With the rename came the removal of the Great Arena's showplace-like entrance with the western saloon door style seen today. We talked about doing some stuff on people, but I don't think we ever thought of a Spotlight on someone! An interesting idea and Mr Cochran would be a great one to include. Thanks!